On the eve of Tuesday, March 25, 1986 (Baramhat 16, 1702 A.M.), the Holy Virgin Mary started Her apparitions in the church of Saint Demiana the Martyr in Papadouplo, near El-Teraa El-Boolakia street, in the overcrowded Shoubra quarter of Cairo, Egypt. On this day, our Lady appeared beside the two towers of the church of Saint Demiana and was first seen by people living in the houses overlooking the church's towers; Her light shone in their houses and they saw Her in Her full body surrounded by a halo of light over the left (western) dome of the church. His Holiness Pope Shenouda III issued a papal order to form a special committee to investigate the matter. Journalist Mosaad Sadek writes: Some of the inhabitants of the houses around the church said that they saw flashes of light shining over the church starting a few months ago, but nobody reflected on the matter. It was only when the Virgin appeared that they started to link the preceding events with the apparitions of the Virgin. The delegation released two statements which detailed their eye witness accounts and stated: "... after examining these phenomena with His Holiness, declares that these apparitions are a blessing for Egypt and a blessing for the Church..."
A report of the Papal Delegation presented to the Holy Synod assembled and headed by H.H. Pope Shenouda III, formally approved the apparitions. Our Lady appeared beside the two towers of the church of Saint Demiana and was first seen by people living in the houses overlooking the church's towers; Her light shone in their houses and they saw Her in Her full body surrounded by a halo. Click here to read the descriptions of some of the forms of the apparitions, as published in Watani newspaper of April 20, 1986 and as reported by eye-witnesses. No messages were given at these apparitions. His Holiness Pope Shenouda III issued a papal order to form a special committee to investigate the matter. The committee examined the accounts of eye-witnesses, and on Thursday, April 10, 1986, at midnight, the members of the Papal Delegation went to the church to watch closely the reported spiritual phenomena. They stayed there till a little before morning. 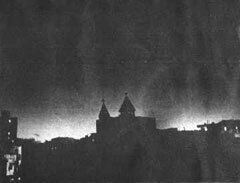 At 3:40 am on the dawn of Friday, April 11, 1986, they saw the Holy Virgin in a clear form surrounded by a halo of light and the apparition continued till 5:00 am. Father Heg. Georgios Amin was also there with the committee to supervise order. The delegation released two statements on April 16, 1986 which detailed their eye witness accounts and stated: "... after examining these phenomena with His Holiness, declares that these apparitions are a blessing for Egypt and a blessing for the Church..."
A report of the Papal Delegation presented to the Holy Synod assembled on June 21, 1986 and headed by H.H. Pope Shenouda III, formally approved the apparitions.